This one-piece, top-down dress or tunic (make it any length you like) has an unusual double-drape neckline. Its fitted shoulders are worked with a vertical decrease from just below the shoulder to just above the armhole. without yarn over short rows this pattern is easy. 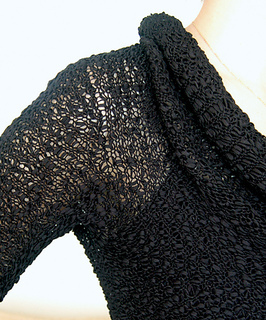 Reverse Stocking stitch on the outside of this dress or tunic gives it an unusual texture. Hem and cuffs are finished in k1, p1 rib.